Last Sunday’s Detroit Free Press had a holiday food section called Feast, consisting of recipes from readers — including yours truly! The Freep ran a contest of sorts, inviting readers to submit recipes via their Facebook page in various categories. I sent this one, and they printed my recipe in the Side Dishes category. My prize was an invitation to the Freep’s Taste Fest at the Great Lakes Culinary Center, an interesting spot I’d read much about but never seen. We enjoyed lots of yummy treats, including a bunch of tasty organic grain- and legume-based salads from a company called Gabby’s Garden. (Locals: they’re carried at Hiller’s, Westborn, Randazzo’s, Market Fresh, Papa Joe’s, Holiday and other local fancy grocery stores.) There was also a nice upgraded green bean casserole, with haricots verts, wild mushroom gravy and crispy shallots. My winning recipe is one I got from the Ocean Spray Cranberries people, but they note that they got it from Vegetarian Times, November 1998. I’ve adapted it slightly. It’s excellent as a side-dish for Thanksgiving or any other fall festive occasion. Before I get to the recipe, I want to let you know that the blog is taking a vacation for a couple of weeks, as I spend some time with my daughter following the birth this week of her daughter! 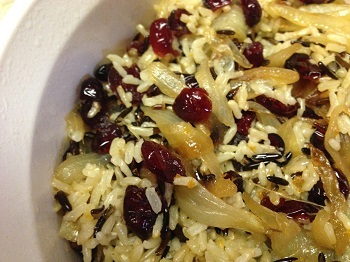 While the rice is cooking, heat the oil in a medium skillet over medium-high heat. Add the onions and brown sugar. When the onions start to soften, turn heat to low and cover the pan for about 5 minutes. Then uncover the pan and continue to cook over low heat, stirring frequently, until all the liquid is absorbed and the onions turn a caramel cover; this will take at least 20 minutes, maybe as much as an hour. Stir in the cranberries. Cover and cook over low heat until the cranberries swell, about 10 minutes. Transfer the rice to a large serving bowl. Gently fold in the cranberry mixture and the orange zest. I got this recipe from my friend Mandy Garver, who said she got it from a French’s fried onions can. I couldn’t believe how easy it was! Crush French fried onions with flour in a zip-lock bag. Dip the chicken pieces in egg. Coat with onion crumbs and press firmly to adhere. Place the chicken pieces in a greased baking pan. Butternut and other winter squashes are plentiful right now — and I think they are becoming increasingly popular, because I’ve been seeing a lot of recipes for them. I love butternut squash, and so I’ll probably be featuring a few recipes for it myself this winter. 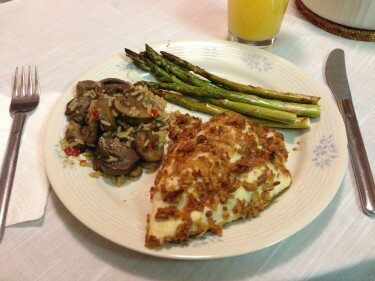 This one is adapted from a good food blog I follow called MediterrAsian, which focuses on Mediterranean and Asian foods. The original recipe called for pumpkin, but I used butternut squash instead. I’m sure the squash or pumpkin tastes fine boiled with the pasta as the recipe directs, but I roasted it ahead of time instead of boiling it, and just put it in with the pasta for a minute to get hot. I also increased the amount of spinach a bit from the original. You can buy peeled and cubed butternut squash at Trader Joe and other upscale groceries. It’s pricey, but it makes the process much easier. I used tri-color penne. You can use plain or a similar shaped pasta such as rotini or ziti. It tasted really good and we had enough left after dinner (for the two of us) for a lunch. Cook the pasta and pumpkin in a large pot of lightly salted boiling water for 8 minutes, or according to package directions. Drain, reserving 3 Tbs. of the pasta water. You can start on some of the other steps while the pasta is cooking. If the pine nuts aren’t already toasted, toast them in a large skillet over medium heat until lightly browned (shake the pan and watch them carefully so they don’t burn). Remove from pan and set aside. In the same skillet heat 2 Tbs. olive oil and cook the onion for 6 minutes. Add the garlic and rosemary and cook for 1 minute. Add the spinach and cook for 4 minutes, stirring frequently. Stir in the pine nuts, salt, pepper, remaining 1 Tbs. olive oil and the 3 Tbs. of pasta water. 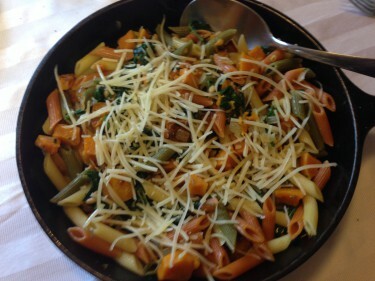 Toss the pasta and pumpkin with the spinach and onion mixture. Top with Parmesan cheese if desired.